No, this is not a Valentine's Day post. It is to do with something very close to the hearts of most red blooded, card carrying Bengalis. And, as the doctors would say, something that would clog the arteries too. But try this. Get hold of a biggish, 3 kg +, caatla or rohu (river trout). Ask your fish seller if the fish is of good quality. If it is, then ask your fish seller to give you the machher tel (fish oil or flab). Get the 'tel' home. Wash it. Gently coat it with a bit of salt and cumin powder. Some would put a dash of flour to coat and chopped chillies and onions too. I prefer to keep it as uncomplicated and pure as possible. Place the 'tel' on a pan and on a flame. You won't need oil. Remember this is oil. Let it lightly fry. You will see an ocean of oil come out. Take the solid parts out. There would be bits of cuddly white flab. Touches of dark sensuous meat. Could be bitter if this fish is not too good. Else the stuff which would set your heart a-flutter. Have this with rice and daal. 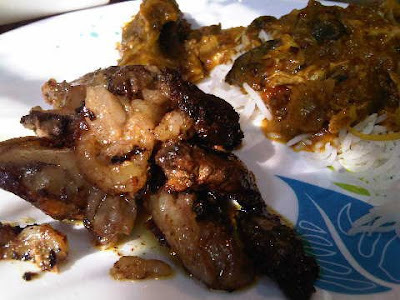 Ideally machher mudo diye bhaaja mooger daal (fried moong dool with fish head). And a green chilli on the side. As decadent, if not more, than pork fat. Possibly as lethal. But hey, you will be in paradise for a few minutes. hey! this brought back memories of childhood when my father would raid lake market in search of macher tel and sabitri (not savitri) di would fry them. we never used cumin. it tastes best lightly fried, crisp outside, quivering inside. one observation though. you called rui river trout. i thought it is carp and not trout. i could be wrong though. I cannot figure out how people can eat 'fat'!!!! !